This is a closeup of a Blacktailed Rattlesnake, Crotalus molossus, from the Superstition mountains that had been clipped by a car. He had some problems with the mouth, as you can see in the photo, but may be ok. I spend so much time looking for these guys that it’s amazing that people don’t see a bright yellow, 3.5′ animal as big around as a coke can laying in the middle of the road. I realize that quite often hitting a rattlesnake is the intentional act of the cowardly miniscule manhood crowd of the American Southwest, but sometimes it’s not. Birders are notorious for it … not that they mean to, but they’re looking UP and just miss whatever’s on the road. In the South East, there have been plenty of times I’m caught behind a binocular-faced duo in an economy car leaving writhing, dying reptiles in their wake. 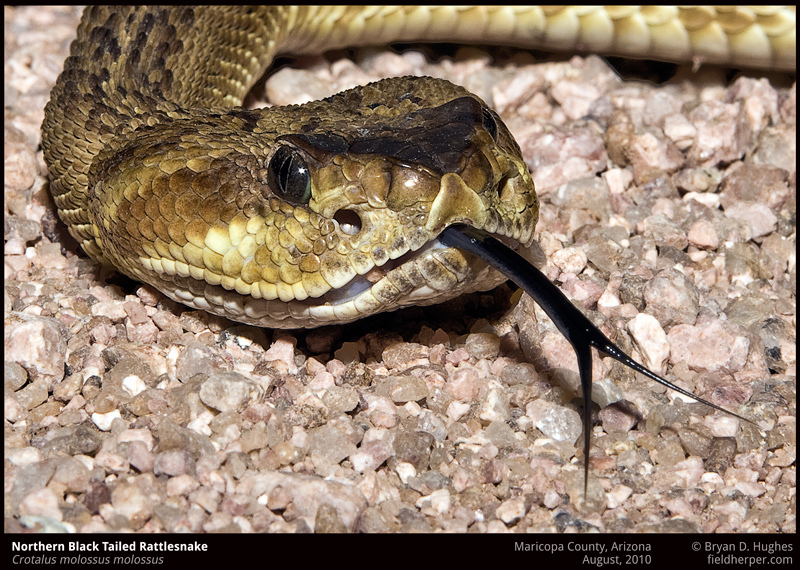 Just last May I found a nearly 7′ gophersnake crossing the road … just massive, brightly colored … impossible to miss. I stopped the car before they ran over it, and they said they were glad I did because they didn’t see it at all. Can’t blame them though … when I’m out looking for snakes I can’t say I’m looking in the trees. Hope this guy is ok. This entry was posted on Monday, March 21st, 2011 at 8:11 pm	and is filed under Field Herping, Field Trips, Personal. You can follow any responses to this entry through the RSS 2.0 feed. You can leave a response, or trackback from your own site. Back in the late ’80’s I was coming home from Four Peaks, buzzing up Rio Verde Road at night in my old Land Cruiser. I caught sight of a perpendicular line in the road ahead of me. Sure enough, a western diamondback, and a big one, sucking up some road heat. I did my best to straddle it. I stopped, checked him out, and I had clipped about 1 inch of his tail, and 1 inch of his head. I’ve felt deeply regretful ever since. I know the feeling. I’ve run over a few snakes as well, and it always just kills the night for me, no matter what we find. Two weeks ago I ran over a threadsnake in the road … something I’ve only seen a handful of.